Oslo (AFP) - NATO began its biggest military exercises since the end of the Cold War in Norway on Thursday, proof of the US' "rock-solid" commitment to the alliance's collective defence, US Navy Admiral James Foggo said, as Moscow denounced the manoeuvres as "anti-Russian". Around 50,000 soldiers, 10,000 vehicles, 65 ships and 250 aircraft from 31 countries were taking part in Trident Juncture 18, which is aimed at training the Atlantic Alliance to defend a member state after an aggression. The show of force comes amid recent concerns over US President Donald Trump's commitment to NATO, in particular the "Article 5" mutual defence clause which requires all member states to come to the aid of another member state. "On Article 5 and the United States' commitment, it is rock-solid," Foggo, who is also the head of NATO's Allied Joint Force Command, told reporters in Oslo. "That commitment is evident in our acts and our deeds." 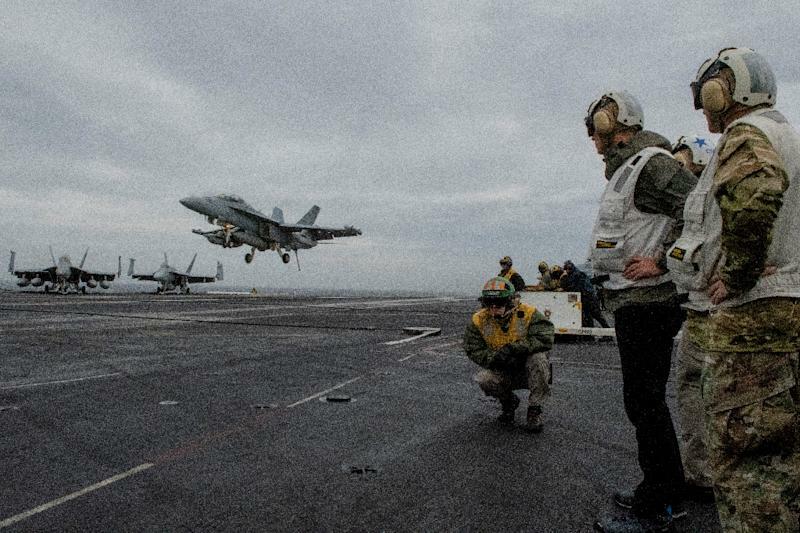 The United States is contributing the biggest contingent to Trident Juncture, including more than 9,000 Marines and an aircraft carrier deployed in Norwegian waters for the first time since 1987. The exercises are also taking place against the backdrop of rising tensions between the West and Russia, which has annexed Crimea and is accused of destabilising eastern Ukraine, which it denies. Moscow has also beefed up its military capabilities in the Arctic, and conducted its own biggest ever exercises in the Far East in September. "In recent years, Europe's security environment has significantly deteriorated," NATO Secretary General Jens Stoltenberg said. 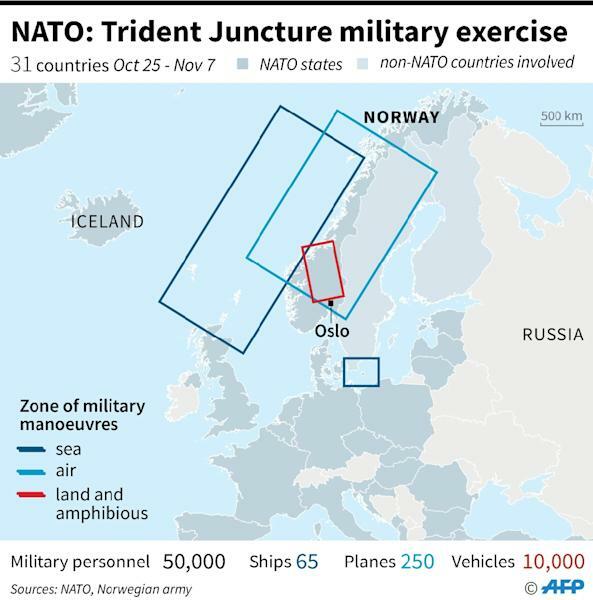 The exercises will take place at a respectful distance from Norway's 198-kilometre (123-mile) border with Russia in the Far North, but Moscow nonetheless denounced Trident Juncture as an "anti-Russian" exercise. "Such activity... comes across as provocative, even if you try to justify it as being of a purely defensive nature," the Russian embassy in Oslo said. Foggo sought to tone down the concerns. "Any fears on the part of the Russian Federation are unfounded," he said. "We defend, we deter, we don't take somebody else's territory. That's not our intent and they are not the focal point of this exercise." Two Russian and two Belarus military observers have been invited to watch the manoeuvres, which run through November 7. "Such irresponsible actions are bound to lead to a destabilisation of the political situation in the North, to heighten tensions," she said. Tensions already flared on Saturday after US President Donald Trump announced he was abandoning a Cold War-era nuclear treaty, a move which Russia warned could cripple global security. Accusing Russia of developing a new missile system, Trump threatened to increase the US nuclear weapons arsenal. In addition to NATO's 29 member countries, Norway's neighbours Sweden and Finland will join the exercises. "We do not see any military threat against Northern Europe today but we live in uncertain and unpredictable times," wrote five Nordic defence or foreign ministers in a joint column published in several newspapers Thursday. "A more confident Russia has demonstrated both its willingness and ability to use military might to achieve its own strategic goals," they wrote, praising the importance of security cooperation among their countries.